Introducing cool amazing games that support gamepad from google play store, I got the Best Games With Gamepad Support On Android and I’m about to blow your mind with a list of them. Playing games with a gamepad is totally amazing, there are no words to really describe how it feels. You might not have a Ps4 or an Xbox One, but you can play any action game that supports gamepad and experience the thrill of playing it, even when your screen is just a 5.5 and above inches of an Android device’s screen. The gamepads can be bought at any accessory store or online and you can play action, adventure, puzzle, racing… games all night long. Now, instead of checking one after the other for a game that can support gamepad and the game won’t just be any regular game on google play store. 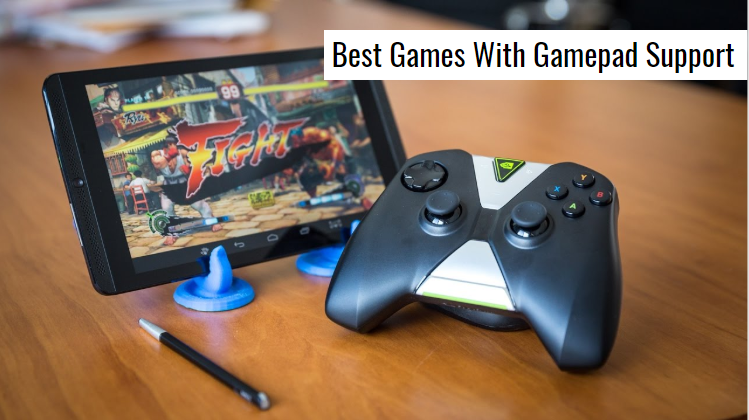 So that is why this article is here, to help you choose from the 12 Best Games With Gamepad support On Android and have fun game time. Experience the boost, the fun, the speed, the extreme fury, play like a racing god in one of the latest, Best Games With Gamepad Support. Pure fun awaits you, gear up and join the track. There are so many amazing features and boosts available for you to take advantage of and drift your way to the top of the racing chain. Drift like never before with a list of amazing cars, basically top-notch high-performance cars, with a whole lot of nitro boost and upgrade to go alongside every mission. Customize your cars, change colors, change and personalize your decals and license plate. Not only does this game supports gamepad, but interestingly enough, it supports TV too, you can connect your smartphone to your flatscreen and play the game and get the best gaming experience ever. This game is just 88MB in the installation size. I’m quite sure many of you must have heard of Asphalt, and have probably played a couple of Asphalt series on your smartphone so here is another one for you, and the fun fact is that this one can be played with a gamepad controller. Go airborne with the one of the most thrilling car racing game on the planet. Drive amazing luxurious cars with top speed and high performance, the sky is the limit for what you can do. Discover new amazing locations and explore every city you are going to be racing in. In Asphalt 8, you can join in the fun multiplayer mode, seasons and leagues, check the leaderboard of all your race events and keep track of all the racing experience. With 100 million downloads so far on google play store, this game is just 99MB in the installation size, but you will need to download some additional file for the game to open fully. Have you ever heard of a game like this before, totally amazing, Modern Combat 5 is a must-see game or should I say must-play game. This is a game that you shouldn’t afford to miss, the Best of the Best Games With Gamepad Support On Android. The graphics are amazing, no doubt about that, the gameplay is just smooth, aim and player sensitivity when on a mission is superb, you might have some difficulties with the aim and player sensitivity at first, but with time when you probably play your first mission, you’ll totally get the hang of it. Now, I know that this kind of game is just perfect with a gamepad controller, again no doubt about that, so you can totally connect your gamepad, whichever type of Android gamepad controller you could get your hands on and they will work pretty well. Now, the downside about this game is that, some Android devices may not be compatible and more so, some Android devices may refuse to connect to the gamepad you have, probable solutions are to try another gamepad controller or search for a way to make your gamepad controller work, there is probably an app for that. This game is 57MB in the installation size, but for sure there are a few additional files to be download when you open the game, to enable you to play the full game. This is an amazing action-packed, FPS action and adventure game on google play store that supports a gamepad controller, one of the Best Games With Gamepad Support On Android, totally one of my most preferred Best Games With Gamepad Support On Android. Catch the thrill of a lifetime while playing this game with a gamepad, totally exciting. You remember those old school FPS (First Perso Shooter) Gameplay that you basically see only the gun and probably your character’s fingers on the trigger, that’s what’s present in this Neon Shadow, connect to a gamepad controller and enjoy the thrill of a lifetime. Multiplayer mode available, but regardless there is a single player career mode that you’ll basically be involved in, that’s where all the missions are. With the cool gameplay in this game, a gamepad controller will be really nice, most especially a Moga controller, although you will need a setup for the Moga controller, all that will be provided for once you connect the controller. So, this amazing game, Unkilled is one of the most polished FPS that totally supports any Bluetooth controller or even Moga controllers and also offers you more than 150 missions in the single-player campaign mode. Now, in addition to the single-player mode, we have got a stunning online multiplayer mode, there are quite a lot of them so, you will have to choose the multiplayer mode you will like to play. Now, playing online, you are going to be able to choose your most preferred character fighter, after that, you’ll progress to upgrade their skills, weapon and get them ready for battle. This game is just 27MB in the installation size, but the game will require you to download an additional file for you to be able to play the game. GTA: San Andreas is one of the most amazing action games with adventurous gameplay, one of Rockstar’s amazing GTA series and this probably goes without saying, also the Best Games With Gamepad Support On Android. The game begins with the character and his journey in Los Angeles and the area surrounding it, one of the most addictive games on google play store, totally perfect for a gamepad controller. Rockstar released this GTA: San Andreas series on Google Play Store, and it has been a game to be reckoned with ever since, this game beats most games as being way better to with a gamepad controller or preferably a Bluetooth controller. The graphics in this game is amazing and totally improves the way the game should look on your Android device. The downside of this game may be recorded as the occasional glitch that occurs when during some missions, but besides that, the game plays amazingly. Join the adventures of CJ (the main character) and your Family always trying so desperately to survive in those streets, while fighting your way through all the gun battles and bad blood against the opposition clan. This game is a paid game, so you are totally going to buy the game online. Goodluck! This is totally one of the Best Games With Gamepad Support On Android, Riptide GP game series is one of the best of all the others although not free, totally a paid game. Amongst all the other Riptide GP series, Riptide GP: Renegade, is basically the best you have seen yet. Riptide GP: Renegade has brought something special to the table, cool features of a career mode, multiplayer mode and some quick races too, this is totally a racing game. The graphics are amazingly outstanding, with the effects on the water and the blur motion effects, makes the game look amazingly real. There are a lot of equipment and tools to unlock and also upgrade, start the career mode and take it to the next level. If you are not really getting it in the career mode, you can always play the quick race mode to practice and get better, play with a gamepad controller to get the full experience. Do find your yourself wishing you knew how to skateboard or rather how you could skateboard way better than you already do like Tony Hawk, well you might not be a pro in the real world, but you can definitely learn a thing or two from this game that will help you in the real world, and also even be a pro in the game and those things won’t be found in the other Best Games With Gamepad Support On Android, that’s why you need this as a skateboard fan. Skateboard Party 3 Pro, amongst my games on my list of the Best Games With Gamepad Support On Android offers an amazing Skateboard experience you probably won’t find anywhere else, and also to add that it’s totally compatible with a gamepad controller. It might take some time for you to get the hang of it, using a gamepad and all, but with time and consistent playing, you’ll be a pro in no time. The complete version of this game is not free, a paid is what this is, but totally worth the money and time. With amazing graphics and smooth gameplay, you will totally be able to choose the game mode that you prefer, out of the eight game modes available in this game. Get all your friends to also download this game and also download the BombSquad Remote and join in the fun. This game is totally available for all Android devices, also including an Android TV, totally amazing right? This game is totally free, just 59MB in the installation size, with over 10 million downloads so far. Evoland 2 is one of the Best Games WIth Gamepad Support On Android. Evoland 2 has fantastic graphics and amazing gameplay with smooth controls. Totally not free, a paid game. I’ve always heard of this game until I downloaded it and played it and it was totally fun, really enjoyed the game on Android and with a gamepad i might add, although the what might be the downside of this game is the fact that the story is kind of short. Evoland 2 has improved ever since the firts series. This game is action-packed, action RPG, but Evoland 2 will get you laughing as with some crazy references like pop culture and the rest. This game is amazing with a lot of fun features, it might be a paid game, but totally worth it. To add to that, this game among my Best Games With Gamepad Support On Android supports a lot of gamepad controllers, both Bluetooth controllers and Moga controllers too. Taking a look back at the list of Best Games With Gamepad Support On Android, I can say that there is not a single game above that isn’t highly entertaining and full of fast-paced action and adventure. Some gamepads are just so adorable, you can place your Android device on an extension from the pad and sit in one position and play for hours and hours. Don’t fail to click on the download link below every game to enable you to download the game immediately and start the fun right away. Gamepad works and some gamepads are not always compatible with some Android devices, so ensure to have a high-end Smartphone that can literally work with any gamepad at all. Thank so much for viewing, for now, I say Adios! 10 Best Skate Games For Android 2018 | Skate Like A Pro! next 10 Best Offline Games For Android 2019~ No Internet Required!